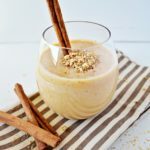 Clever Cinnamon Smoothie – If you are using the tahini (sesame paste) in this smoothie it is a good source of calcium, iron, heart-healthy fats, and protein. It also adds to the creamy texture. Hemp seeds are another source of nourishing fat and plant-based protein that help boost our energy. Cinnamon is the signature ingredient in snickerdoodles, a naturally sweet-tasting spice that helps stabilize our blood sugar, which is key for sustained energy and mood. If you are using the tahini (sesame paste) in this smoothie it is a good source of calcium, iron, heart-healthy fats, and protein. It also adds to the creamy texture. Hemp seeds are another source of nourishing fat and plant-based protein that help boost our energy. Cinnamon is the signature ingredient in snickerdoodles, a naturally sweet-tasting spice that helps stabilize our blood sugar, which is key for sustained energy and mood. Put all ingredients in a blender and blend until smooth and creamy, about 45 to 60 seconds. Serve.